Oh, Thailand. A country that’s full of anything you’re looking for. Miles of the prettiest beaches around, dense jungles filled with quaint little villages to explore, ancient ruins, waterfalls, picturesque lakes you can visit while you spend time out in a colorful bungalow. As if that wasn’t enough, Thailand also boasts one of the most impressive capital cities in the world: Bangkok. 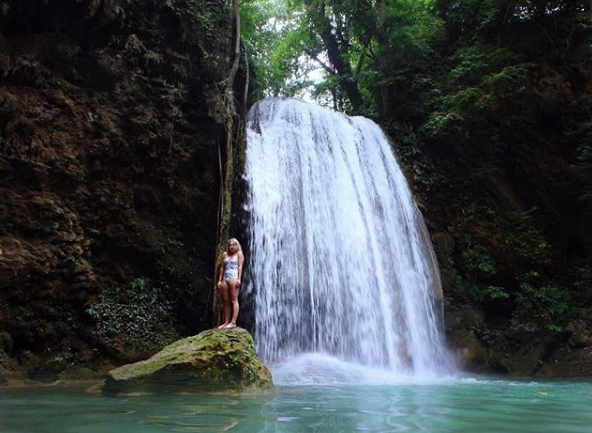 Feel like you need more time in Thailand? See the best of the best with our Thailand Destination Guide. In such a sprawling city, you’ll want to make sure you are seeing this best of the best. Good thing we have an insider’s guide to Bangkok. We’ve talked to our volunteers and have put all of our favorite restaurants, things to do, places stay, and other tips to make sure you’re seeing it all. Head's up: Since these are places of worship, you want to be respectful and very modest in your dress. That means no tank tops, shorts, no shirts that show your stomach, no miniskirts, nothing see through, no torn pants, or anything too tight. It’s a place of worship, so best to wear a tee shirt that covers your shoulders and a flowy skirt that reaches the floor. You will be required to rent skirts (sometimes for free, sometimes for a 30+ Baht charge) if you aren’t dressed appropriately. You might also be asked to take your shoes off at some points. 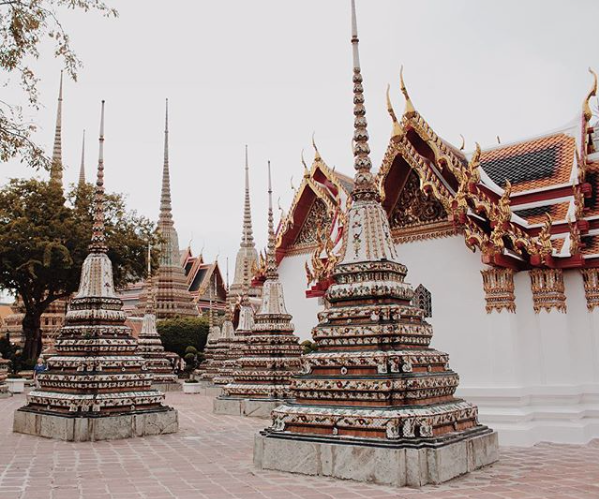 “You have to go to the Grand Palace and see all of the buildings, temples, the Emerald Buddha, and the amazing architecture.” It’s a must- see in Bangkok, so make sure you make room for it in your itinerary. 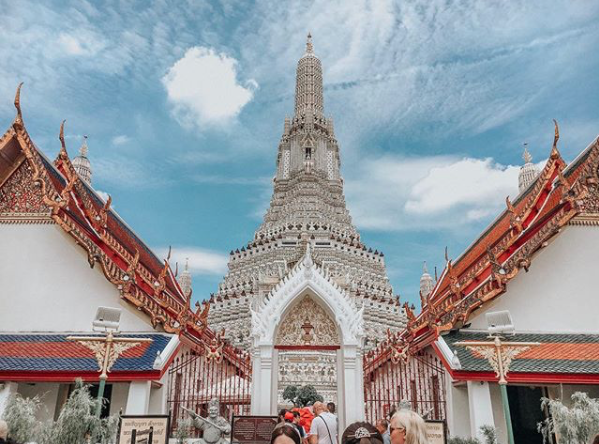 The Grand Palace is huge complex of stunning buildings, the residence of the King of Siam, dozens of temples, courtyards, throne halls and other things to explore. It’s massive! To give you an idea, you can check out this really helpful map of the Grand Palace. 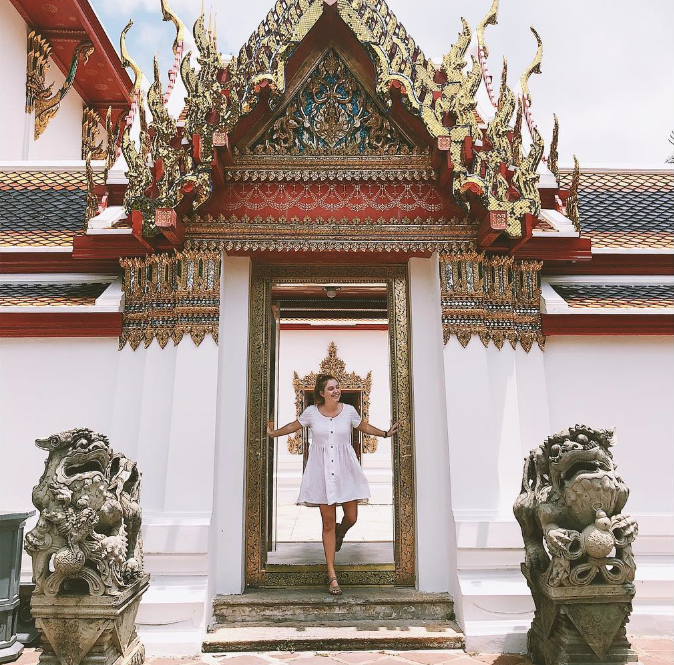 Our volunteers recommend seeing these attractions inside, but you really can’t go wrong because everything in the Grand Palace is pretty stunning. Tips: Don’t let people scam you outside the palace. They’ll tell you it’s closed or that the wait is really long because they try and get you to go on their tours. They are lying! Don’t trust anyone who tries to stop you from going in — it’s open year round! 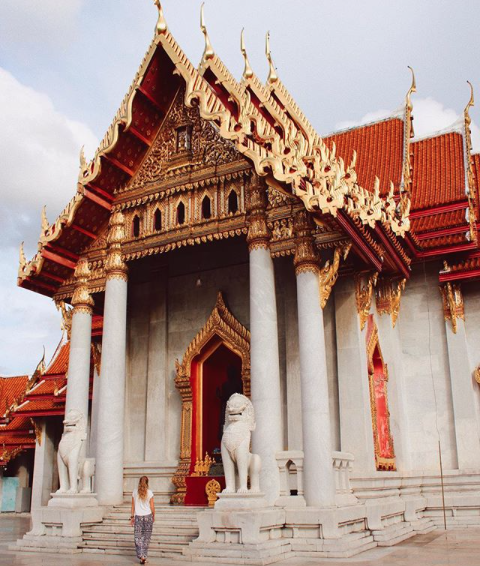 Built in an intricate Cambodian style, this particular temple has been around for a few hundred years, appear on early European maps of the city. The pearly, painted porcelain is definitely ionic, and seems to shine in the early hours at sunrise, or if you’re lucky, one of the pink-and-orange sunsets you can sometimes find in Bangkok. Plan on climbing a few insanely steep set of steps if you want to get to the higher viewpoints around the temple, and leave time to explore the surrounding gardens. Getting Here: Walk down to pier 8 (Tha Tien Pier) which is right across from Wat Pho. You’ll find regular boats to take you over to Wat Arun, for 3 Baht. Tips: Get dinner at Eat Sight Story Deck so you can watch the sun set behind the temple. It’s a bit pricier but the view is stunning. Check out the menu here. This used to be the first public university which is pretty impressive if you look at this complex and compare it to any college in the United States! Beautifully intricate and ornate, Wat Pho houses a few sites ILP volunteers recommend, including the Reclining Buddha. Stretching over 150 feet long and some 50 feet tall, the entire figure of this Buddha is covered in gold, from head to toe. Don’t leave without peeking into four chapels which hold 394 golden Buddhas all in sitting in lotus position. Getting Here: It's an easy 10 minute walk from the Grand Palace or you can hop into a tuk-tuk. As a head’s up, these markets are about 2-3 hour outside of Bangkok … but most volunteers absolutely love visiting them we’re including them in our Bangkok section since you can definitely do them in a day, and still have time to return back other city to hit up another night market if you’d like. There are several to choose from, but volunteers tend to visit the Damnoen Saudek Floating Market. Cost: Depends. Hiring a boat for the day is the best bet (150 - 400 Baht) instead of paying for little short rides throughout the day. Plus, you'll need to add on transportation to actually get to the markets which will depend on how you're getting there (tour, private driver, etc). Getting There: Best to hire a driver (your Local Coordinator may be able to help you arrange a van to drive you to Bangkok, then drive you around Bangkok) or go with a hostel. Volunteers mention Good One Hostel having a tour that’ll take you to the floating markets and back, though you'll find others. Also known as the Night Market on Backpacker’s Street, this is a huge mecca for all of your knock-off shopping needs, plus just a pretty fun experience. From food vendors selling our go-to street foods to rows of vendors sporting backpacks, purses, sunglasses, shoes, souvenirs, etc. it's kind of the best place to window shop (you'll find better prices in the markets in Chiang Mai, but that doesn't mean Khao San Road isn't fun to walk around). Hours: Best to visit after dark, though there are some stores and vendors open earlier. Get lost in some 8,000 stalls at this weekend market (which some claim as the biggest market in Asia). There are 26+ sections of souvenirs and supplies sold, broken up into categories. You'll find everything from arts, food and rinks, plants, pets, souvenirs, clothing, shoes, and more in this sprawling market. Ride the MRT to Chatuchak Park Station, and go through exit #1. You'll see a small entrance that leads to the clothing section of the market. 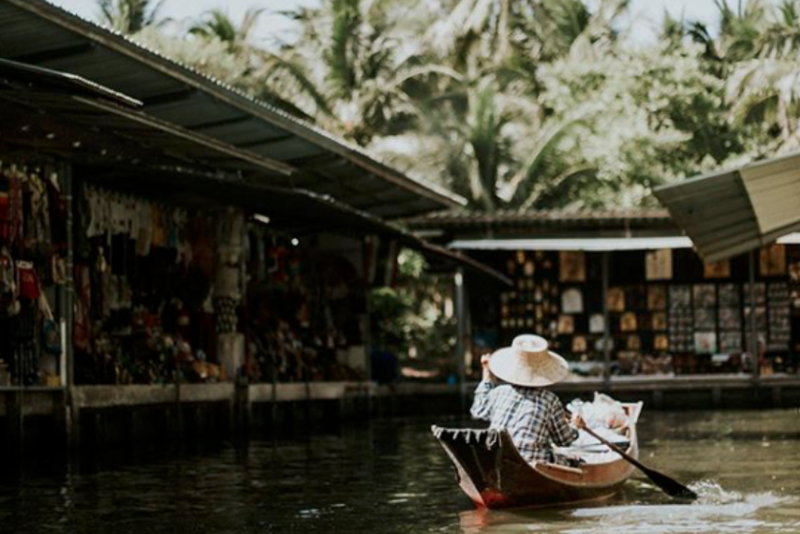 One ILP alumna hands down recommends taking a night cruise on the river that flows in and out of Bangkok. You can find a huge variety of options (some include a fancy and expensive dinner), but most are around 2 hours long. Plan on paying anywhere from $30 to upwards of $90, depending on what you book. Doing a quick search online can help you decide which option is best. 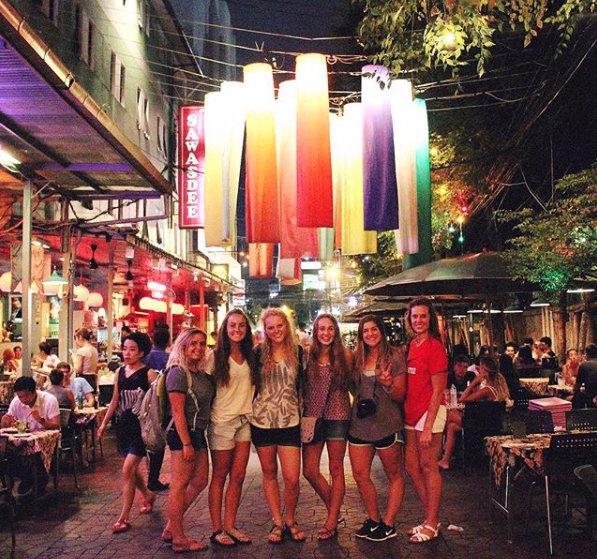 The best hostels to stay at in Bangkok (according to ILP volunteers). This is a recommendation made by pretty much all of our volunteers who take the chance to have dinner above the bustling city of Bangkok. There are several spots around the city where you can sip drinks, have dessert, or a full-on dinner on the 40-something floor of a building which gives you quite the view. We have more details about our favorite sky bars here. You’ll find vendors all over the city (and in places like the Thai Islands) selling fresh coconut ice cream, drizzled with some chocolate or strawberry, and topped with peanuts. So yummy and less than $1. Check on the walk from the Grand Palace to Wat Pho, or the vendors around Chatuchak market. We love the food in Thailand, but after living in Asia for a few months, you might want something different which is where Sunrise Tacos comes in. Get your fill of fajitas, tortilla soup, horchata and other goodies on the 4th floor of this huge mall. A favorite of anyone who loves rainbows and unicorns, this Bangkok cafe is sort of the stuff dreams are made of. 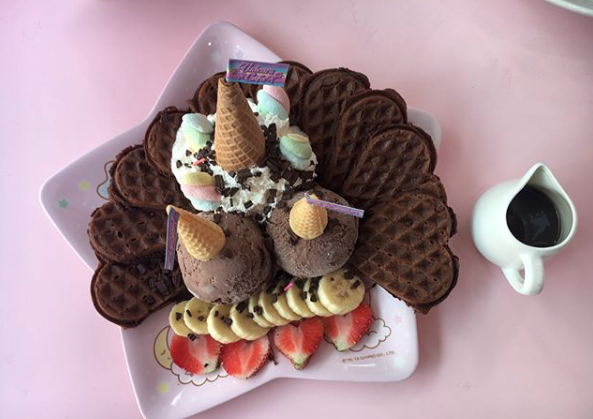 We love their ice cream and waffles, but you can get other magical creations while you dress up in a unicorn onesie. Here’s how to get to the Unicorn Cafe. An oldie, but a goodie is when taxi or tuk-tuk drivers will tell you that the grand Palace is closed for the day or for just a few hours … but this other destination is open and they will take you there. Seems nice, right? Not so much. The Grand Palace is open every day of the year. Some drivers will also drop you off at a Thai-only entrance so you’ll be stopped by security if you try to enter. Just find someone who speaks English to point you to the Tourist entrance. Another thing to be aware of: if someone hands you a bag of birdseed “for free”, just know it’s not for free. Just shake your head and refuse if someone tries to give you bird seed to feed the pigeons with. Applicable to anywhere you’ll take a taxi or tuk-tuk, we suggest being aware of these taxi scams to help you save money and get to your destination on time, which is what you want, right? One thing to know in Bangkok … it’s not extra to keep your luggage in the trunk of the car, so don’t pay if you have a driver who charges you extra for that. We’ve mentioned before, but most ILP volunteers can fit in quite a bit on a weekend to Bangkok, and tend to visit again to experience a nearby national park, so a 2 day visit is a pretty good goal to shoot towards, or 3-4 days if you plan on seeing Bangkok, plus some place like Lopburi or the floating bungalows. Let's say Saturday is your first full day in Bangkok. Start early in the morning to avoid crowds and avoid the heat. Bangkok has two airports you need to be aware of: Don Mueang International Airport (DMK) and Suvarnabhumi Airport (BKK) and the two are about an hour apart (more with traffic). Both airports have flights in and out of Thailand so you’ll need to keep straight which airport you’re flying in and out of. Our ILP volunteers are living up near Phitsanulok where you can find deals to Bangkok for around $20-$30 (it's a one hour flight) on airlines like Nok Air and Air Asia. Both airports are about 30-50 minutes outside of the city, so once you land, you’ll need to factor in the time it takes to hop on the metro or call a cab to take you to where you want to go. This is the longest option, but you can get a one-way ticket on an overnight train for about 500 Baht from Phitsanulok. It’s a convenient option because the train drops you right off at the airport. One suggestion: Volunteers suggest booking 1st or 2nd class tickets and avoid booking a lower class. Typically, the trains in Thailand usually aren’t as nice or comfortable as the buses, but it’s better if you book a more expensive ticket. The train rides are about 6+ hours. You can look at bookings here. You can also take a long distance bus to Bangkok. It’s the most affordable option (with tickets around 300 Baht or less for a one-way ticket). The bus rides are a good overnight option since it’ll take you 6-7 hours to arrive. You can look at bookings here. One major perk of volunteering in Thailand with ILP is that you’re set up with a Local Coordinator who can help you arrange a few things that you might not have been able to. Some groups have gotten help hiring a van to take you down to Bangkok + drive you around for the weekend. It’s about $17 - $36 per person to make that happen, depending on how many people you are splitting the van with. Plan on a 5+ hour drive. When it comes to getting around this huge city, the easiest way is to hail a tuk-tuk or a taxi. 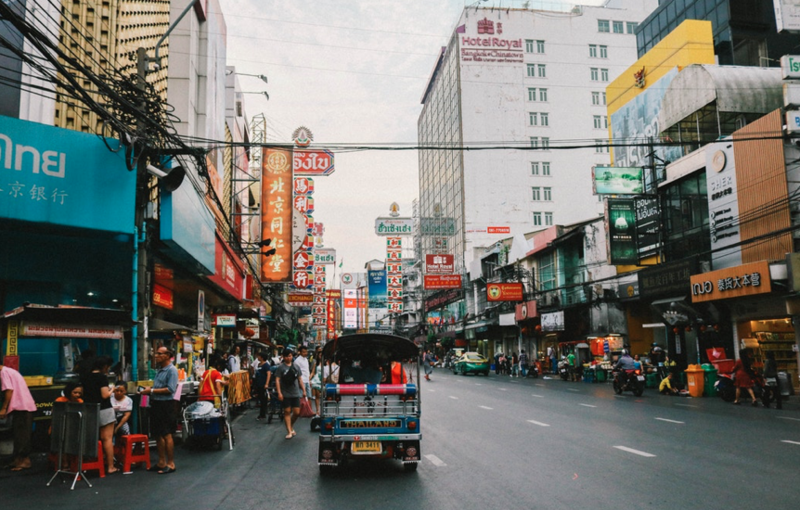 The traffic in Bangkok can get very congested with some 14 million vehicles on the roads, so just keep that in mind when you’re traveling around to certain places and need to get there in a hurry. As a general rule, taxi prices start at 35 baht for the first kilometer, then will tack on 5.5 baht for each kilometer. You’ll also pay if you get stuck in traffic. All in all, even if you travel 10 km, you’ll only pay around $3 which isn’t bad if you split the fare. Make sure your driver always, always uses the meter. Tuk Tuks are also affordable, with a 10 km ride costing about 30-60 kilometers if you bargain a price. Set the price before you get inside to help avoid being charged too much. Bangkok also has a skytrain system (BTS) and an underground metro (MRT). The rates are very affordable for a ticket if you’d like to go that route. You’ll find metro stations and BTS stations pop up on your Google Map app. 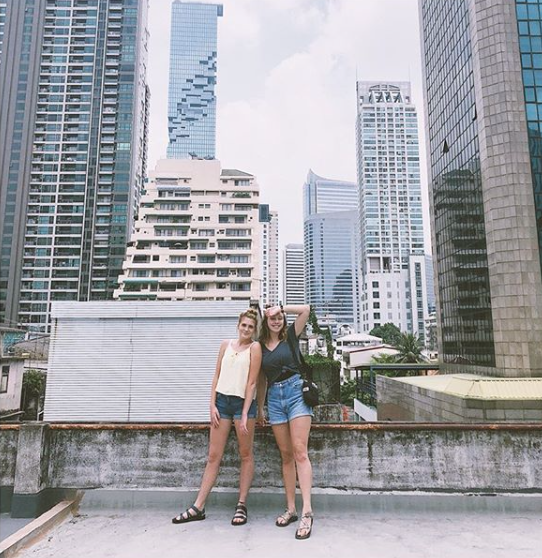 We love, love, love, Bangkok ... but it's not even our favorite place to vacation. You get to see all the best of Thailand by living there as an ILP volunteer. 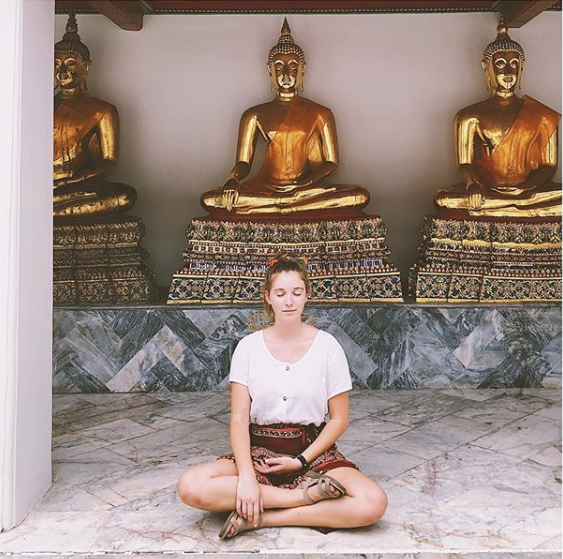 Spend a semester teaching English part time, with weekends off and vacation days to experience everything from Bangkok to the northern jungles, to the beaches in the south.